MPAA Rating: for intense depiction of mature thematic material. The issue of abortion—what does the Bible say? This film was adapted from Ramon Sampedro’s book Letters From Hell. God has a way of waking people up; we sometimes get ahead of Him, and He is forced to intervene to get our attention. With non-believers, sometimes He uses the intervention as a wake-up call to change and to turn to Him. People (non-Christians) may be living great lives and have everything going for them, but are brought to their knees when everything falls apart around them. It is in these times that God is begging for their attention, for them to recognize their need for Him. God has plans for their lives and wants to use them greatly, but they first have to notice Him. He is a confident man, who exudes genuine charm and warmth from the confines of his bed. Yet, he feels that his life has no dignity, no redemptive value, and wants the right to end it without being viewed in a shameful light by the rest of society. His lawyer is Julia (Belen Rueda), who takes his case for free because, we learn, she may understand his pain more than she lets on. She has an assistant, who ends up doing most of the legal work, while Julia and Ramon form a close relationship, even while Julia’s patient, caring husband waits at home. Another woman comes into Ramon’s life, Rosa (Lola Duenas), who sees Ramon plead his case on television and wants to be his friend, and convince him that life is worth living. She is a rather lonely woman who uses Ramon almost as her service project to somehow redeem her admittedly miserable existence. 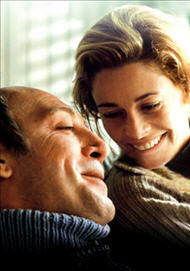 Ramon tells her that she is no friend of his if she does not respect his right to die. 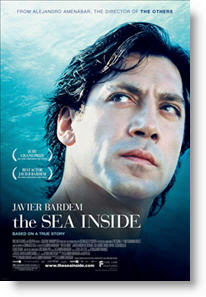 “The Sea Inside” is a technical success. Javier Bardem is stunning as Ramon. He spends the majority of the film in bed, and yet his real acting job is done with his eyes and facial expressions. We believe that Ramon is a charming man who could make a woman fall for him, because Bardem makes us believe it. The film is also shot beautifully, with the cameras swooping around the Spanish valleys and hills and water as Ramon flies “in his mind” to the beach, the place he loves. The musical score is a bit too much, and tends to overemphasize some scenes by blaring its haunting dirge almost nonstop. It is a beautiful, don’t get me wrong, but it would have been best suited for scenes of special importance, not every five minutes. The content of the film is very mild. There is very little language; I can only remember one subtitled “s” word. Sexual content is almost nonexistent, although Ramon does put his hand down Julia’s shirt, saying he is feeling her heartbeat. There is no violence, but there is the disturbing scene, played a couple times, of Ramon diving into the ocean and hitting the sandy floor. The PG-13 rating of this film is mainly due to the subject material, and Christians should be prepared for it before viewing. I went into the film with an open mind, hoping the film would be more about him, and his life, than about his wish to die. But, the film makes its message very clear early on: people should have the right to do with their lives whatever they want, and anyone who thinks otherwise needs to mind their own business. Ramon got very little sympathy from me; his character is maddeningly smug, and seems to go about his business not to die with dignity, but almost to die with more attention. There are some religious characters in the film, including a quadriplegic priest who tries to convince Ramon that life is worth living. However, they are seen as meddling, narrow-minded conservatives who run their lives on old-fashion mode. I cannot recommend the film, not necessarily because of the message it delivered, but because of the way it went about doing it. God had a plan for Ramon’s life, yet Ramon cared little for it. He made it clear he didn’t believe in God or an afterlife, and lived his last thirty years with an almost “woe is me” mindset. I have come across a number of quadriplegics in my life, and all have been Christians. They have exuded such warmth and happiness and love for life and God that I couldn’t help but feel sad for Ramon. He simply didn’t get it. God has given us a life worth living, a life worth staying alive for. Things may not always go our way, and sometimes God may have to do something drastic to get our attention. But the joys we are in for, once God does finally get our attention, far outweigh the alternative, and we wish people like Ramon would just realize it before it’s too late. Negative—In response to Hamlet’s query “To Be or Not to Be” the famous Christian writer G. K. Chesterton declared that “the answer is to be.” This year’s motion picture academy awarded its best picture and best foreign picture awards to films which answered the Dane’s soul search with a nihilistic “not to be.” This is the second year in a row (last years’ winner for best foreign film, “The Barbarian Invasions” was also a pro-euthanasia film) that the Oscar for Best Foreign Language Film has been given to a work that is an ode to active suicide and to assisted suicide. Such is progress. “For when I am weak, then I am strong” (2 Corinthians 12:9). The hero of “The Sea Inside” becomes quadriplegic after a diving accident. He lives for 27 years after the accident. That is an accomplishment in itself. He fulfills the lives of his family and friends. He writes a book. Perhaps he could write another. Instead he chooses to commit suicide, and he enlists the help of a poor woman to mix the fatal drink for him. She is a pawn in the same way that all the characters in this story are pawns—pawns of a director who wants to make a point and to grind an axe. “Million Dollar Baby” falls apart when Clint Eastwood tries to present the other side of the argument. Hollowness presented in earnest is still hollow. “The Sea Inside” falls apart in the first frame. There is no argument, as we see when the quadriplegic priest enters the picture. I was educated by Jesuits, and despite flaws, they are not stupid and not easily silenced in an argument. Javier Bardem, one of our finest film actors, makes a mess of the character he plays. His handsome but uneven features are unable to put a believable face on human suffering. Christopher Reeve and Michael J. Fox and John Paul II have given human suffering a human face, and they did not or have not shrunk from their challenges (crosses), even when some of us say, “I wouldn’t want to live like that.” “Million Dollar Baby” and “The Sea Inside” tell us that we can make a choice about whether we live or die. Of course we can, but these filmmakers lose their footing if they confront the meaning of that choice. Right now, these 2 films are fashionable, which means they are products of their times. I doubt that either will become a classic. If euthanasia and assisted suicide are not passing fashions, much more than the future of Hollywood is at stake. …Humanist pro-Death propaganda… The filmmakers also lovingly promote Sampedro’s humanist views against the existence of God and the existence of an after-life.